Brightens white and gray hair. Shampoos away yellow. Refreshes faded highlighted hair. Tones down brassiness. Maintains and refreshes cool, ash-toned hair color. Leaves hair shiny without residue. Clairol Shimmer Lights Shampoo / Conditioner, Blonde & Silver - YOU PICK !! This award-winning, protein-enriched color-enhancing shampoo tones down brassiness on blonde or gray hair. Specifically formulated for blonde or gray hair. Tones down brassiness on blonde / gray hair. Clairol Professional. blonde, highlighted, and silver hair. Color-enhancing purple conditioner. After shampooing, work conditioner through hair. Removes dull yellow in gray / white hair. Leaves hair shiny, healthy-looking, &. Shampoo 16 oz. Conditioner (Combo Deal). Shampoos away yellow, and refreshes faded highlights. Directions: Apply to wet hair. Lather, rinse, and repeat. No patch test required. Leaves hair shiny with no residue. Lather, rinse & repeat. For extra brightening & color, leave second lather on 3-5 minutes. No patch test required. Tones Down Brassiness On Blonde And Gray Hair, Color-Enhancing Formula. Removes Dull Yellow In Gray/White Hair, Refreshes Faded Highlights, Tones Down Brassiness, Leaves Hair Shiny. It renews and refreshes faded highlights and ash toned hair, removes dull yellow in gray/white hair, and leaves hair shiny without residue. Color enhancing shampoo. Brightens and refreshes blonde, highlighted, and silver hair. CLAIROL Shimmer Lights Shampoo 8 oz (Blonde & Silver) Pro Color Enhancing! (Blonde & Silver). 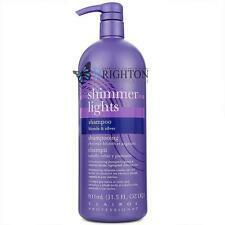 Color-enhancing shampoo brightens & refreshes blonde, highlighted, and silver hair. Tones down brassiness on blonde / gray hair. Removes dull yellow in gray / white hair. Lather, rinse & repeat. Clairol Professional. Color-enhancing purple conditioner. blonde, highlighted, and silver hair. After shampooing, work conditioner through hair. Each 16 oz / 473 ml. Removes dull yellow in gray / white hair. Protein-Enriched Conditioning Formula Tones Down Brassiness On Blonde And Silver Hair Renews And Refreshes Faded Highlights And Ash-Toned Hair Removes The Dull Yellow In Silver Hair Leaves Hair Shiny Without Residue. Also available in a formulation for brunettes and redheads, this conditioning shampoo takes away the brassiness of blonde and silver hair. Massage the formula into your roots, and say goodbye to the yellow after a rinse. Blonde & Silver Color-Enhancing Conditioner. Brightens silver hair and neutralizes yellow as it conditions. Refreshes faded highlighted hair and tones down brassiness. Silkens coarse gray hair. Removes Dull Yellow In Gray/ White Hair. 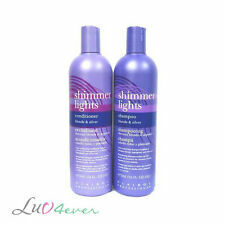 Clairol Shimmer Lights Shampoo (31.5 Fl Oz). The price for one bottle. Condition is New. Shipped with USPS Priority Mail. Tones Down Brassiness On Blonde and Gray Hair. About the product. This award-winning, protein-enriched color-enhancing shampoo tones down brassiness on blonde or gray hair. - Specifically formulated for blonde or gray hair. 100% authentic, fresh & new. Refreshes faded highlighted hair. Tones down brassiness. Maintains and refreshes cool, ash-toned hair color. Shampoos away yellow. 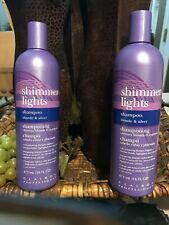 1 ~ Clairol Shimmer Lights Shampoo Brunette & Red 16 oz. Nopatch test required. Leaves hair shiny with no residue. Specifically formulated for blonde or gray hair. SHAMPOO FOR BLONDE & SILVER. CLARIOL PROFESSIONAL. Removed dull yellow in gray / white hair. Renews & refreshes faded highlights. Tones down brassiness. It refreshes faded highlights, removes the dull yellow in gray hair and elaves hair shiny without residue - and it can be used on natural or color-treated hair. Free Nail File. We strive to be the best; leaving a 4 star DSR is as bad as leaving a 1 star DSR. 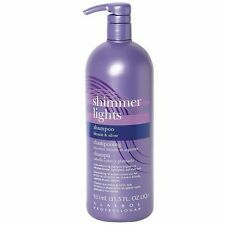 Clairol Shimmer Lights Hair Conditioner for Blonde & Silver hair 16 oz. 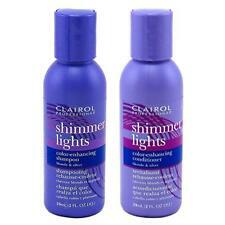 Clairol Shimmer Lights Hair Conditioner for Blonde & Silver hair 16 oz. . Condition is New. Shipped with USPS Priority Mail. 2 Clairol Shimmer Lights Shampoo 31.5 Fl Oz Blonde and Silver hair Professional. Condition is New. Shipped with USPS Priority Mail. Hair is left vibrant and shiny without the heavy residue or oily feel. Give us a shot and we will make sure that you will look to us again! You're already purchasing the item. Quality Products. 2 Bottle of blonde & silver 16 fl. 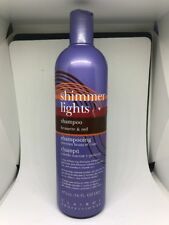 Clairol Shimmer Lights Original Shampoo Blonde and Silver 8 oz. 8 fl. oz. Clairol Shimmer Lights Shampoo (Blonde & Silver) 16 Ounce (473ml) (6 Pack). Clairol Shimmer Lights Shampoo - Blonde & Silver... New! Free Shipping!